Car or bike accidents are a common yet scary sight. In our country the frequency of road accidents is so high that at-least 1 accident occurs each minute. 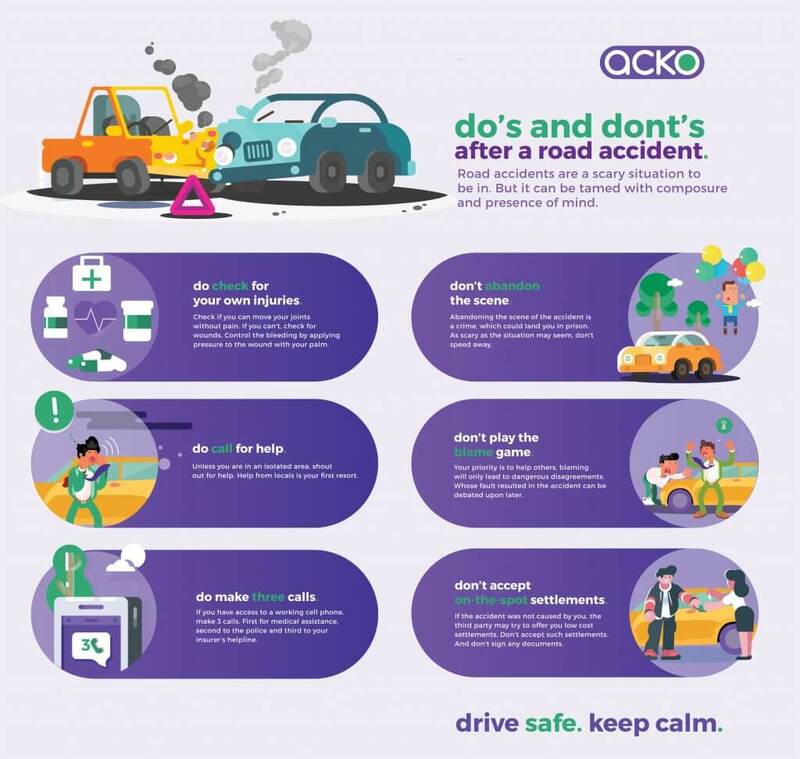 Here are a few things that you should do and things that you should avoid if you find yourself in a road accident. As soon as possible, try to check yourself for injuries. Try to move your arms and legs to find injured spots in case you don’t see a bleeding wound. If you find one, try to control the flow by tying a cloth an inch above the open wound. You can also press a piece of cloth directly on the wound with the help of your palm. Irrespective of the nature of an accident, do not escape from the scene. You could be charged under a “hit and run case.” This could result in imprisonment. The worst is, you are abandoning casualties which can be saved if you stayed. If you see more people are injured in an accident, the first thing you could do is shout the word “help” multiple times. Locals would be the first to attend an accident spot. You might have suffered injuries and damages due to the accident. However, blaming the other person will only add to the panic already caused by the accident. The first should be for medical help. The second call is to the police, to report the accident, and the third is to the insurance helpline. If you suffer injuries due to an accident, ‘personal accident’ cover comes into picture. It is a compulsory PA cover for owner driver generally bundled with Third-Party car insurance. If the accident was evidently not your fault, the third party may offer low cost settlements. This does not serve the purpose of insurance. Never accept verbal-on-the-spot settlements.